St John, generally distinguished by the appellation of Climacus, from his excellent book entitled Climax, or the Ladder to Perfection, was born about the year 525, probably in Palestine. By his extraordinary progress in the arts and sciences he obtained very young the surname of the Scholastic. But at sixteen years of age he renounced all the advantages which the world promised him to dedicate himself to God in a religious state, in 547. He retired to Mount Sinai, which, from the time of the disciples of St. Anthony and St. Hilarion, had been always peopled by holy men, who, in imitation of Moses, when he received the law on that mountain, lived in the perpetual contemplation of heavenly things. Our novice, fearing the danger of dissipation and relaxation to which numerous communities are generally more exposed than others, chose not to live in the great monastery on the summit, but in an hermitage on the descent of the mountain, under the discipline of Martyrius, an holy ancient anchoret. By silence he curbed the insolent itch of talking about everything, an ordinary vice in learned men, but usually a mark of pride and self-sufficiency. By perfect humility and obedience he banished the dangerous desire of self-complacency in his actions. He never contradicted, never disputed with anyone. So perfect was his submission that he seemed to have no self-will. He undertook to sail through the deep sea of this mortal life securely, under the direction of a prudent guide, and shunned those rocks which he could not have escaped, had he presumed to steer alone, as he tells us. From the visible mountain he raised his heart, without interruption, in all his actions, to God, who is invisible; and, attentive to all the motions of his grace, studied only to do his will. Four years he spent in the trial of his own strength, and in learning the obligations of his state, before he made his religious profession, which was in the twentieth year of his age. In his writings he severely condemns engagements made by persons too young, or before a sufficient probation. By fervent prayer and fasting he prepared himself for the solemn consecration of himself to God, that the most intense fervour might make his holocaust the more perfect; and from that moment he seemed to be renewed in spirit; and his master admired the strides with which, like a mighty giant, the young disciple advanced daily more and more towards God, by self-denial, obedience, humility, and the uninterrupted exercises of divine love and prayer. In the year 560, and the thirty-fifth of his age, he lost Martyrius by death; having then spent nineteen years in that place in penance and holy contemplation. By the advice of a prudent director, he then embraced an eremitical life in a plain called Thole, near the foot of Mount Sinai. His cell was five miles from the church, probably the same which had been built a little before, by order of the Emperor Justinian, for the use of the monks at the bottom of this mountain, in honour of the Blessed Virgin, as Procopius mentions. Thither he went every Saturday and Sunday to assist, with all the other anchorets and monks of that desert, at the holy office and at the celebration of the divine mysteries, when they all communicated. His diet was very sparing, though, to shun ostentation and the danger of vainglory, he ate of everything that was allowed among the monks of Egypt, who universally abstained from flesh, fish, &c. Prayer was his principal employment; and he practiced what he earnestly recommends to all Christians, that in all their actions, thoughts, and words they should keep themselves with great fervour in the presence of God, and direct all they do to his holy will. By habitual contemplation he acquired an extraordinary purity of heart, and such a facility of lovingly beholding God in all his works that this practice seemed in him a second nature. Thus he accompanied his studies with perpetual prayer. He assiduously read the holy scriptures and fathers, and was one of the most learned doctors of the church. But, to preserve the treasure of humility, he concealed, as much as possible, both his natural and acquired talents, and the extraordinary graces with which the Holy Ghost enriched his soul. By this secrecy he fled from the danger of vainglory, which, like a leech, sticks to our best actions and, sucking from them its nourishment, robs us of their fruit. As if this cell had not been sufficiently remote from the eyes of men, St. John frequently retired into a neighbouring cavern which he had made in the rock, where no one could come to disturb his devotions or interrupt his tears. So ardent were his charity and compunction, that his eyes seemed two fountains, which scarce ever ceased to flow; and his continual sighs and groans to heaven, under the weight of the miseries inseparable from his moral pilgrimage, were not to be equaled by the vehemency of the cries of those who suffer from knives and fire. Overcome by importunities, he admitted a holy anchoret named Moyses to live with him as his disciple. 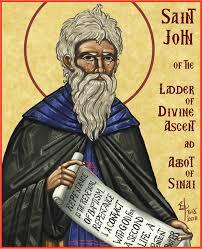 God bestowed on St. John an extraordinary grace of healing the spiritual disorders of souls. Among others, a monk called Isaac was brought almost to the brink of despair by most violent temptations of the flesh. He addressed himself to St. John, who perceived by his tears how much he underwent from that conflict and struggle which he felt within himself. The servant of God commended his faith, and said, "My son, let us have recourse to God by prayer." They accordingly prostrated themselves together on the ground in fervent supplication for a deliverance, and from that time the infernal serpent left Isaac in peace. Many others resorted to St. John for spiritual advice; but the devil excited some to jealousy, who censured him as one who, out of vanity, lost much time in unprofitable discourse. The saint took this accusation, which was a mere calumny, in good part, and as a charitable admonition; he therefore imposed on himself a rigorous silence for near a twelvemonth. This, his humility and modesty, so much astonished his calumniators that they joined the rest of the monks in beseeching him to reassume his former function of giving charitable advice to all that resorted to him for it, and not to bury that talent of science which he had received for the benefit of many. He who knew not what it was to contradict others, with the same humility and deference again opened his mouth to instruct his neighbour in the rules of perfect virtue, in which office, such was the reputation of his wisdom and experience, that he was regarded as another Moses in that holy place. St. John was now seventy-five years old, and had spent forty of them in his hermitage, when, in the year 600, he was unanimously chosen Abbot of Mount Sinai, and superior-general of all the monks and hermits in that country. Soon after he was raised to this dignity, the people of Palestine and Arabia, in the time of a great drought and famine, made their application to him as to another Elias, begging him to intercede with God in their behalf. The saint failed not, with great earnestness, to recommend their distress to the Father of mercies, and his prayer was immediately recompensed with abundant rains. St. Gregory the Great, who then sat in St. Peter's chair, wrote to our holy abbot, recommending himself to his prayers, and sent him beds, with other furniture and money, for his hospital, for the use of pilgrims near Mount Sinai. John, who had used his utmost endeavours to decline the pastoral charge when he saw it laid upon him, neglected no means which might promote the sanctification of all those who were entrusted to his care. That posterity might receive some share in the benefit of his holy instructions, John, the learned and virtuous Abbot of Raithu, a monastery situate towards the Red Sea, entreated him by that obedience he had ever practiced, even with regard to his inferiors, that he would draw up the most necessary rules by which fervent souls might arrive at Christian perfection. The saint answered him that nothing but extreme humility could have moved him to write to so miserable a sinner, destitute of every sort of virtue; but that he received his commands with respect, though far above his strength, never considering his own insufficiency. Wherefore, apprehensive of falling into death by disobedience, he took up his pen in haste, with great eagerness mixed with fear, and set himself to draw some imperfect outlines, as an unskillful painter, leaving them to receive from him, as a great master, the finishing strokes. This produced the excellent work which he called "Climax; or, the Ladder of religious Perfection." This book, being written in sentences, almost in the manner of aphorisms, abounds more in sense than words. A certain majestic simplicity- an inexpressible unction and spirit of humility, joined with conciseness and perspicuity-very much enhance the value of this performance; but its chief merit consists in the sublime sentiments and perfect description of all Christian virtues which it contains. The author confirms his precepts by several edifying examples, as of obedience and penance. In describing a monastery of three hundred and thirty monks which he had visited near Alexandria, in Egypt, he mentions one of the principal citizens of that city, named Isidore, who, petitioning to be admitted into the house, said to the abbot, "As iron is in the hands of the smith, so am I in your hands." The abbot ordered him to remain without the gate, and to prostrate himself at the feet of everyone that passed by, begging their prayers for his soul struck with a leprosy. Thus he passed seven years in profound humility and patience. He told St. John that, during the first year, he always considered himself as a slave condemned for his sins, and sustained violent conflicts; the second year he passed in tranquillity and confidence; and the third with relish and pleasure in his humiliations. So great was his virtue that the abbot determined to present him to the bishop in order to be promoted to the priesthood, but the humility of the holy penitent prevented the execution of that design; for, having begged at least a respite, he died within ten days. St. John could not help admiring the cook of this numerous community, who seemed always recollected, and generally bathed in tears amidst his continual occupation, and asked him by what means he nourished so perfect a spirit of compunction, in the midst of such a dissipating laborious employment. He said that serving the monks, he represented to himself that he was serving not men, but God in his servants; and that the fire he always had before his eyes reminded him of that fire which will burn souls for all eternity. The moving description which our author gives of the monastery of penitents called the Prison, above a mile from the former, hath been already abridged in our language. John the Sabaite told our saint, as of a third person, that seeing himself respected in his monastery, he considered that this was not the way to satisfy for his sins; wherefore, with the leave of his abbot, he repaired to a severe monastery in Pontus, and after three years saw in a dream a schedule of his debts, to the amount in appearance of one hundred pounds of gold, of which only ten were cancelled. He therefore repeated often to himself, "Poor Antiochus, thou hast still a great debt to satisfy." After passing other thirteen years in contempt and the most fervent practices of penance, he deserved to see in a vision his whole debt blotted out. Another monk, in a grievous fit of illness, fell into a trance, in which he lay as if he had been dead for the space of an hour; but, recovering, he shut himself up in a cell, and lived a recluse twelve years, almost continually weeping, in the perpetual meditation of death. When he was near death, his brethren could only extort from him these words of edification, "He who hath death always before his eyes will never sin." John, Abbot of Raithu, explained this book of our saint by judicious comments, which are also extant. We have likewise a letter of St. John Climacus to the same person concerning the duties of a pastor, in which he exhorts him in correcting others to temper severity with mildness, and encourages him zealously to fulfil the obligations of his charge; for nothing is greater or more acceptable to God than to offer him the sacrifice of rational souls sanctified by penance and charity. St. John sighed continually under the weight of his dignity during the four years that he governed the monks of Mount Sinai; and as he had taken upon him that burden with fear and reluctance, he with joy found means to resign the same a little before his death. Heavenly contemplation, and the continual exercise of divine love and praise, were his delight and comfort in his earthly pilgrimage: and in this imitation of the functions of the blessed spirits in heaven he placeth the essence of the monastic state. In his excellent maxims concerning the gift of holy tears, the fruit of charity, we seem to behold a lively portraiture of his most pure soul. He died in his hermitage on the 30th day of March, in 605, being fourscore years old. His spiritual son, George, who had succeeded him in the abbacy, earnestly begged of God that he might not be separated from his dear master and guide; and followed him by a happy death within a few days. On several Greek commentaries on St. John Climacus's ladder, see Montfaucon, Biblioth. Coisliana, pp. 305, 306.